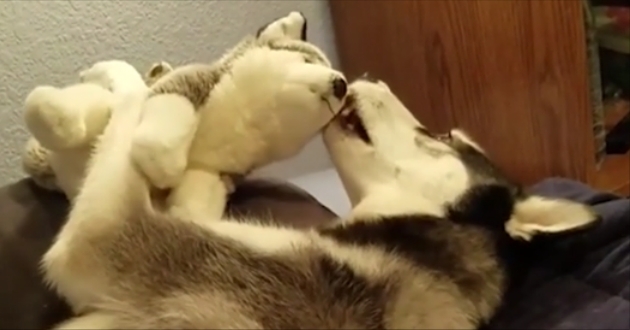 White Wolf : Hilarious moment a husky is freaking out over a stuffed version of herself. Hilarious moment a husky is freaking out over a stuffed version of herself. Meet Luna – an adorable 35 pound, 2-year-old, little baby husky from Colorado. In the video, you can see her playing with her little stuffed sibling, and it looks like, well, only one of them is participating! Too cute. Luna, a Siberian husky and star of Instagram account coloradoluna, was recently confronted with a stuffed version of herself. Normally, we'd think nothing of this – a toy is a toy – but what if dogs see these miniature versions of themselves and have been freaking the eff out all this time? That's what seems to happen here in this footage. A few licks, some sniffs followed by a short wrestle and suddenly Luna pushing that stuffed pet as far away from her as possible. We're sure that Luna and her stuffed friend are no doubt best pals by now… but then again, we've seen Child's Play. Toys are evil. Responses to "Hilarious moment a husky is freaking out over a stuffed version of herself." I thought Luna was simply trying to get the toy to play with her.